GOM Inspect - ЧТО НОВОГО? Какими новыми возможностями обладает актуальная версия программного обеспечения GOM Software 2018? Several parts can easily be virtually assembled in a project. Even measured meshes of two parts can be aligned with each other using different options. Therefore, inspections are possible not only within a part, but also between parts. The physical assembly can be predicted or reconstructed based on individual parts. 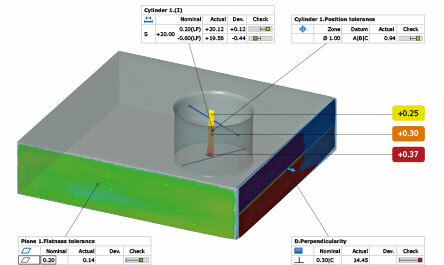 Users can, for example, precisely inspect gap and flush dimensions between the individual parts and prevent collisions. 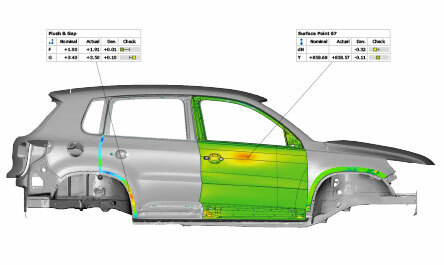 The GOM Software 2018 offers an optimized workflow for robogrammetry to measure car bodies even faster, more accurately and with fewer means. 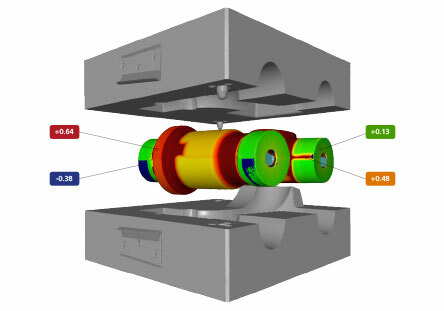 Thanks to new measuring principles, you can now analyze bolts and threads without adapters. In addition to standardized evaluations, GOM offers inspection principles that users can adapt individually to their measuring tasks. This makes it easy to transfer a user-specific gap and flush analysis from one point to other points on the same or another part. GD&T checks of a part or a part assembly that are specified in an engineering drawing can be directly chosen in the GOM Software 2018 thanks to the optimized workflow. The software automatically recognizes geometric elements and freeform surfaces and GD&T can be adapted accordingly. Functional aspects, such as parallelism, flatness and positions in the local datum and coordinate system, can thus be inspected faster and more comfortable. The results can be displayed in a colored deviation representation. Augmented reality: A new mode enables inspection results to be displayed directly on the real object and viewed on a tablet with an integrated camera or another mobile device with an external webcam, for example during audits. Interactive presentation mode: The new, simple user interface enables interactions, such as rotating the part and configuring the legend, while the report pages themselves remain unchanged and thus protected. Extended import of CT data: Even if the volume data is larger than the main memory of the computer, it can be imported into the GOM Software 2018 and then polygonized. Open data exchange: In addition to the existing import and export options, a compound of CAD patches, polygonized meshes and several stages can now be exported, for example, as G3D or STL files. Calibration of the measuring setup during automated measurement: Using the new function, CAD data of the measuring object and, if necessary, of the fixture can be positioned exactly based on real data so that the measuring setup is calibrated for the project. Inspection of draft angles: The inspection of draft angles extends the range of the inspection functions available to date. With these functions, surfaces can be identified that can cause problems during demolding of a tool, for example, in casting processes. Extended analysis of surface defects without CAD data: In the GOM Software 2018, an estimated reference surface can be created to be able to distinguish defects from the real shape of the part more clearly. Optimizations for aerospace industry: A new deviation label and the optimized workflow for profiles with different tolerance regions can be used especially for the inspection of the profile shape and position of an airfoil. Evaluating the photogrammetry quality: Based on the precision computation of the individual reference points in the 3D view, conclusions on the quality of the entire measuring setup can be drawn, especially for expert analyses. Post-processing of polygon meshes: In addition to previous error corrections, sewing errors and inconsistencies due to triangles with opposite surface normals can now also be corrected easily. Для получения дополнительной информации см. серию видео «Что нового?» (What´s New Videos) на YouTube. Registration for live webinars at www.gom.com/events/webinars. Details and registration for training courses at www.gom.com/events/training.